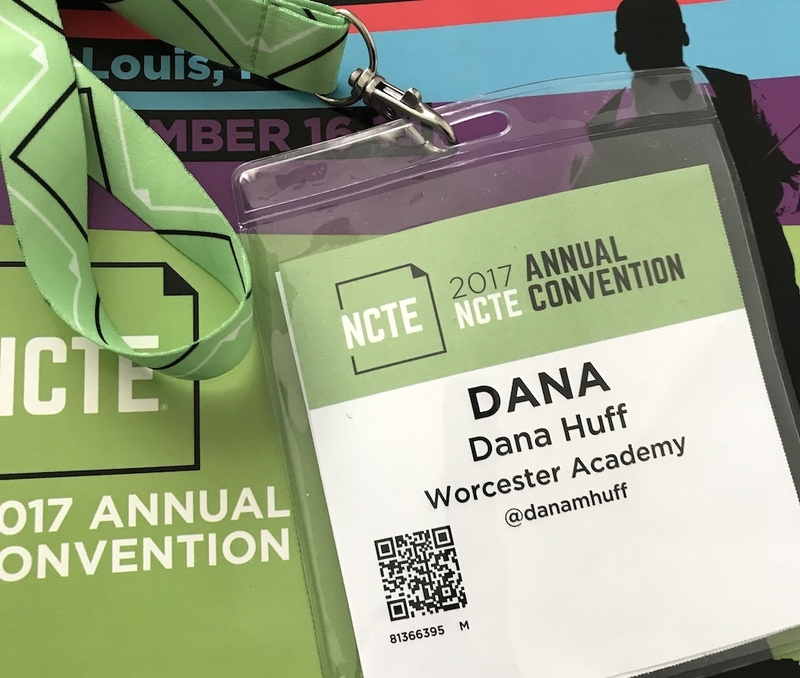 I reflected on Friday and Saturday at this year’s NCTE conference in previous posts. This post is my final reflection on Sunday’s events. Session K started before the Sunday Keynote. I attended K.06: Public Rhetoric: Agency, Voice, and Mission in the Public Sphere, a roundtable discussion. The session included three roundtable discussions. I rotated among tables led by Jennifer Ansbach, Debbie Greco, and Camille Marchand. Jen discussed the shifting nature of language in the news, Debbie discussed memes as visual rhetoric, and Camille discussed using primary source documents (letters) to teach To Kill a Mockingbird. Great first session! After session K, Gareth Hinds delivered his keynote. I created a Storify to document my own tweets and capture highlights from other attendees. I especially enjoyed seeing Gareth’s early work. I captured a bit of video as he did a live demonstration, too. We need to think about our students as users and design accordingly. I couldn’t stay for all of session M because I was afraid I’d be late for my own session, but it was amazing. M.08: Breaking the Classroom to Prison Pipeline. The title might have been a bit misleading as it was really more about seeing our students and social justice. I was curious about the session because its leaders were Linda Christensen and Dyan Watson. I knew that Linda Christensen has done a lot of work in social justice in education. I recently ordered two of her books to read. It was a really great session with opportunities to write and turn and talk. I left it a few minutes early to hustle across the convention center for my session. I presented N.18: Representing, Rendering, and Respecting Diverse Lives and Labels with Ruth Quiroa and Leah Panther. My topic was digital storytelling. One more minor complaint: NCTE made a deal with the GO Shuttle shared van service, and it was a great discount. Unfortunately, as far as I could determine, the latest shuttle to the airport on Sunday left at 3:00 PM, which was in the middle of the last session. I tried lying about when my flight left to see if there were any later shuttles, and I couldn’t find any. Obviously, this means anyone taking advantage of the great shuttle deal had to leave early. I doubt this is NCTE’s fault, but I wonder if they took it into consideration when they made the deal with Go Shuttle. It was about three times as expensive for me to get an Uber ride to the airport, as I couldn’t take advantage of the shuttle deal. The last session of the last day is hard all the way around, but I felt bad for my fellow presenters who had prepared great presentations. I am glad I have friends who came to my session at the end of the conference on Sunday at the end of the day. 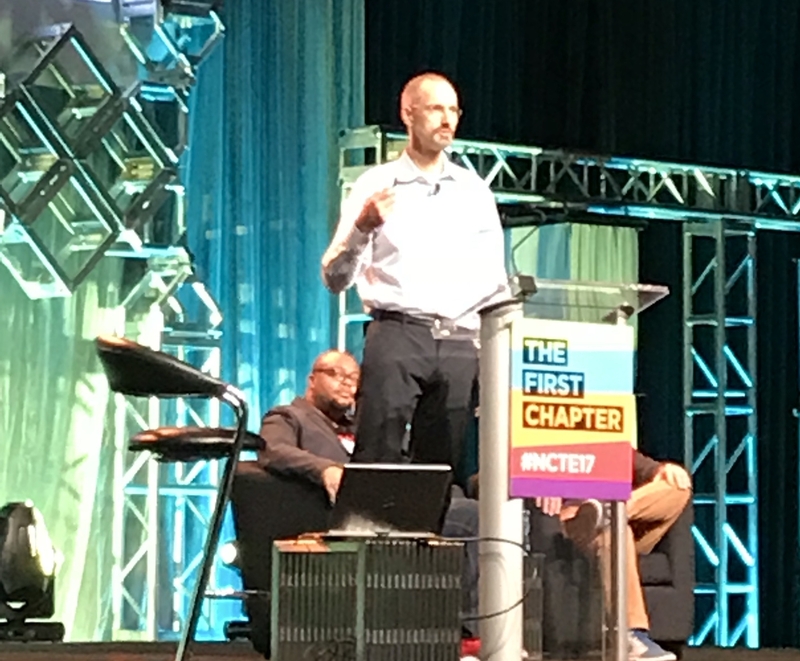 In my last post, I reflected on Friday at last week’s NCTE conference. I decided to split my conference reflection into three posts this year, so this post will focus on Saturday at the conference, and the next post will concern the conference’s final day. The conference guide had a misprint that stated Jacqueline Woodson’s keynote began at 8:00, and even though the app was updated to reflect the accurate time of 9:00, I didn’t check it. I honestly can’t remember anymore how I spent that time. The exhibit hall wasn’t open yet, but people were lined up to enter it. Honest question: why? The exhibit hall will be there all day. What are people lining up in order to do? Jacqueline Woodson’s keynote was great. I created a Storify of Twitter highlights. I found Storify and Twitter to be a great way for me to take notes and capture highlights at this conference. I’ve used it before, but not extensively. Some important questions emerged for me from Woodson’s keynote: What can we do to make it easier for teachers of color to attend (and feel welcome) at this conference? The larger question: How can we encourage more people of color to become educators? Children need to see themselves reflected in their school faculty. I have attended Tom Romano’s sessions for a few years now, and I went again this year. Each year he makes me more excited to do multigenre writing projects. This year, I picked up a few ideas I hope to be able to use with my freshmen when they do multigenre projects later this year. Romano remarked that he is noticing more of his college students have previously done multigenre work than in the past. I didn’t go to a G session and opted instead for a yogurt lunch and for the exhibit hall, which was pretty much the only time I spent in the exhibits the whole weekend. I picked up the free Scholastic tote (my husband has a running joke about how many totes I have), and I bought Gareth Hinds’s new graphic novel of Poe’s short stories and asked him to sign it. I attended my friend Jennifer Farnham’s session with Brooke Eisenbach, H.30 Creating an Environment of Social Justice in the English Classroom. Jennifer and Brooke hadn’t realized it would be a panel session and thought they would be at a large roundtable session, but you’d never have known it. We had time to discuss issues of censorship and social justice at our tables. It was an excellent session. Jennifer and Brooke shared some excellent tools. 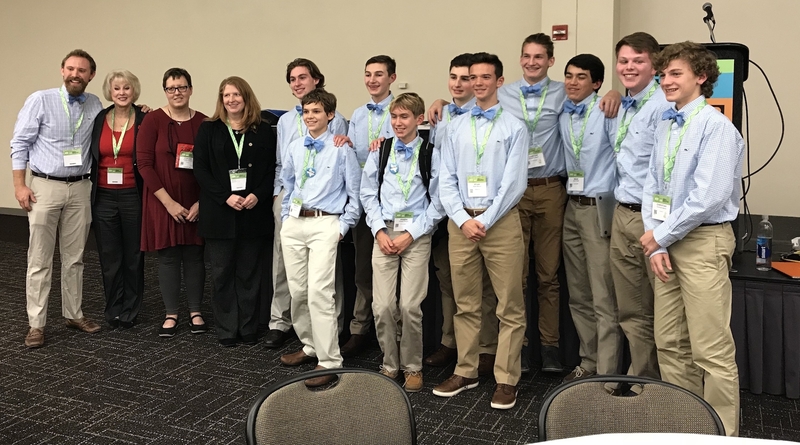 Next, I attended I.20 Recapturing Assessment: Student Voices in Aiding Our Mission which was a roundtable session led by the #BoyTieBoys and their teacher Jason Augustowski. What an incredible session! Each of the Boy Tie Boys shared an Ignite-style presentation and then rotated to a new table. One big takeaway from their session is that we need to see more students at this conference. We can learn a lot from students themselves about what works with assessment and what doesn’t work. Some themes emerged from the boys’ presentations: students want choice about how they show their learning and they want to get to know their teachers in order to learn from them. I should add also that the Boy Tie Boys’ Twitter game was top notch. They captured some great ideas while attending keynotes and conference sessions. My last Saturday session was J.37 Fake It ‘Til You Make It: Rhetoric in the Era of Fake News. I’d have been interested in this topic even if I was not friends with most of the panel of presenters, which included Deborah Appleman, Glenda Funk, Debbie Greco, Cherlyann Schmidt, and Ami Szerencse. The panel presentation focused on how to teach students how to think critically about the rhetoric they hear and how to evaluate news sources. It was a great session, and the entire panel generously shared materials and ideas. I didn’t stay out very late on Saturday as I was nursing a cold and would be presenting and traveling the next day, but I did enjoy a brisk walk around the corner for some delicious pizza before I curled up for the night to read, transcribe some notes, and think. On a completely unrelated note, I changed the theme of my blog again because it bothered me that visitors had to hunt around to figure out how to comment on posts. I hate anything that interferes with the user experience. I initially changed to a new theme because I discovered the one I used did not fill up the entire screen on devices with wider screens. I didn’t realize this problem because it filled up the screen on my old laptop. However, once I discovered it, it bothered me to no end, so I changed the theme. I never could adjust to the new theme. I tried to find other themes that would work, but I wasn’t happy with anything, so I finally sat down today and created a child theme based on the old theme I was using, which is Twenty Fourteen by WordPress. I think I have successfully made the changes I needed to so that the theme fills the screen, but let me know if you notice anything weird because I have never made a child theme before. I anticipate needing more than one post to process my learning at NCTE this year. I had a great conference, and I noticed an improvement in a few areas I’ve criticized in the past. One complaint I’ve had in the past is that materials were not posted online. Conference organizers made greater efforts (at least I noticed greater efforts) in encouraging participants to post materials online, and in sessions themselves, more presenters explained how to access their materials online. I think this is a trend in general because I have noticed it at other conferences as well, but I am grateful for the increased ease of access. I have expressed fears that NCTE is becoming an echo chamber and that sessions from more well-known voices in the organization tend to leech away from other presenters. Efforts were made to highlight sessions by other presenters this year, and thank goodness, the “big names” were put in the theater where everyone who wanted to hear them could fit. I decided to focus on going to sessions with a social justice theme this year. I went to so many great sessions that it will be hard to pick out highlights. I attended Jimmy Santiago Baca’s keynote on Friday also, and I made a Storify of Twitter highlights. I only swept the exhibit hall once during the conference, and that was to get Gareth Hinds’s new Poe book and the Scholastic tote. Hinds graciously signed my book for me, too. I also stood in line for Angie Thomas to sign a copy of The Hate U Give for me. I recently read and reviewed that book on my book blog. I wish I had made time for Jason Reynolds to sign something, but I would have had to buy books anyway as my copies of his books are currently in the hands of students. I walked out of some sessions when it became clear that they were not going to be interactive. If I have one suggestion I hope NCTE will consider for future conferences, and it’s that presenters who plan to read papers be required to explicitly state that they will be reading a paper in their session. I hate to be sitting in the front row and leave once I realize the session description was deceptive. I also hate to avoid sessions by college presenters on the chance they will be reading a paper. I’m sure many of them are exactly what I’m looking for, but it’s taking a risk. I don’t think I’m alone in that I attend this conference to learn and interact with teachers, not to hear papers. I am sure others DO attend to hear papers. Why not make it easier for everyone to figure out this information? NCTE Pro Tip: For the first time this year, I made a concerted effort to rank my choices in order of preference and write those numbers next to the session abstract in the conference book. By Sunday, I had adopted a scheme that worked great. 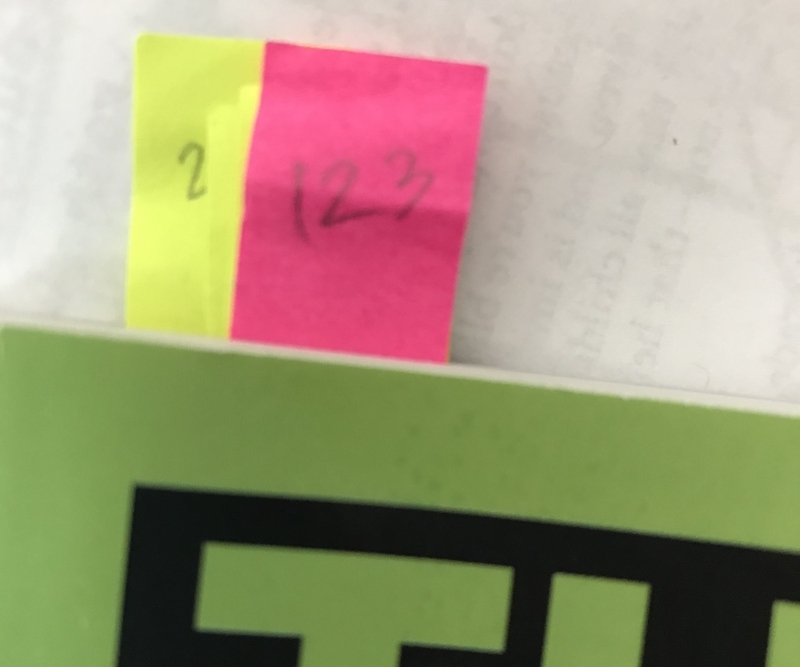 I used post-it tabs and wrote the room number for the sessions I’d bookmarked at the top of the tab, so I could see the room numbers without flipping through the book. 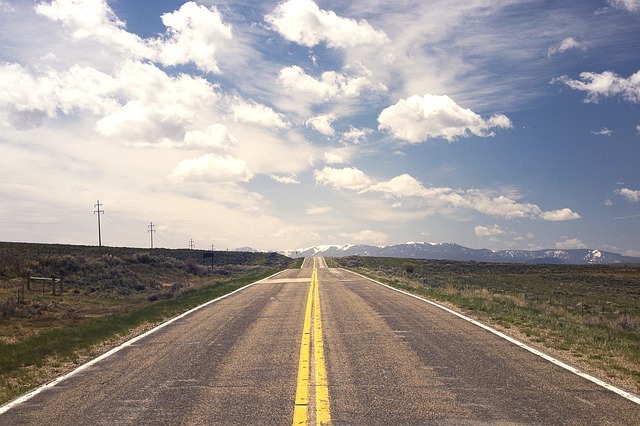 It made my travels Sunday a lot easier, and I only wish I’d thought of doing it sooner. It’s probably just as easy to rely on the app, but I found this to be an even quicker way to double-check room numbers than the app. If I had to leave my first choice session, it was easy to flip through the book and find my second choice. As a side note: This conference is expensive. The conference fee itself is over $200 for members, and that doesn’t include hotel and travels. I have been in the position of having to pay for it out of pocket in the past because my previous school didn’t value the experience. It has been fairly difficult for me when I’ve had to pay for it myself, too. Many people mentioned how cost-prohibitive the conference is, and how it might be preventing especially teachers of color from attending. I am fortunate that my current school has covered the costs for me to go each year I have wanted to go. If you do go to NCTE, always remember this is YOUR conference. Either you or your school paid good money for you to go. If you are not going to learn from or enjoy a session, by all means, LEAVE IT. There are so many great sessions scheduled each block. You are doing yourself a disservice if you stay in a session that is not going to help you or your students or your school. Don’t feel bad about it, either. I’ll focus the remainder of this post on the sessions from Friday alone, and then write posts about Saturday and Sunday to make it easier for readers to digest. Neither A session I attended was memorable, sadly. I walked out of one (reading a paper), and the other was just not executed well, though I didn’t leave it. I probably should have, but by the time I’d already left one and transversed the conference center to a second and stayed long enough to figure it that it, too, wasn’t going to be as helpful as I’d thought, a lot of time for session A had passed, so I wasn’t sure I’d get as much out of my third choice after so much time had passed. 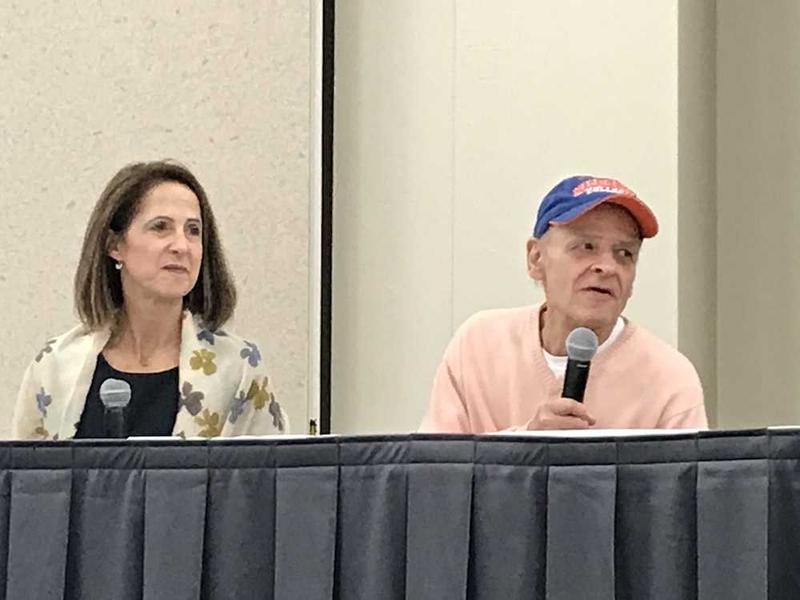 I enjoyed hearing from Tim O’Brien and Lynn Novick about teaching the Vietnam War. O’Brien signed a few session attendees’ copies of The Things They Carried. My rookie mistake? I knew he’d be at the conference. I planned to attend his session. And I left my copy of that brilliant book of his on my shelf at school. I am appropriately mad at myself, don’t worry. O’Brien and Novick presented in session B.51: The Vietnam War and the Power of Storytelling. I created a Storify of Twitter highlights from the session. I didn’t realize the C session was at the same time as the CEE luncheon with Angie Thomas. Oops. So I wound up not doing a C session, but Angie Thomas’s keynote at the luncheon was great, and I also created a Storify of Twitter highlights from her keynote. I left my first choice D session (which didn’t turn out to be what I thought it would be), and went to the featured D.01 session “Queering English Studies: Navigating Politics, Policies, and Practices in ELA Learning Spaces.” It was a good roundtable session. I was late, so I only went through two roundtables, but both were helpful. I am so incredibly glad I attended that session. I not only got some great ideas for writing assignments out of it, but also a great discussion about teaching Baldwin and Coates, as well as how to teach students to discuss writing in general. In my next post, I’ll discuss how my Saturday went. I spent a good part of today looking over the workshops for the NCTE Annual Conference. I am noticing a few interesting trends. First, there seem to be quite a few workshops focusing on using our voices for advocacy. It’s not really surprising that in a time when many teachers feel silenced or ignored, it’s great to see NCTE encouraging teachers to find their voices, and especially to blog. Many folks will say blogging is on the way out, but I maintain it’s still relevant (of course, I must; I’m blogging at this very moment). Time is a very important reason teachers give for not blogging (tech know-how is another). The tools are pretty easy to learn (most of them are WYSIWYG and are familiar to word processor users), but time is not so easy. I maintain, as I frequently do, that we make time for the things that are important to us, and if blogging is important, then we’ll make time for it. Second, I’m noticing that I am much more drawn to Rainbow Strand and LGBT Strand sessions than I have been in the past. I have been doing some work with inclusive classrooms at school, and I find myself connecting to ideas around diversity. In fact, I have begun to approach my teaching of American literature through this lens. I am not sure I can articulate this half-formed thought, but I’m going to try. I find myself at a crossroads of sorts. I’m trying to figure out what I believe as a teacher. I’ve shifted a lot since I started writing this blog. I have written about ideas and beliefs here, and I find that I no longer agree with myself. I don’t think I’ve really processed some of the ways in which I’ve changed. What is non-negotiable? In particular, as my role as a department chair/leader, what do I need to do to bring my department to the place where I want it to be and where the school wants it to be? Like I said, these thoughts are not fully formed. I am trying to figure out exactly who I am as an English teacher. I guess, in some ways, I am working on some identity issues. Perhaps that is why I am so attracted to discussions about students’ identities. I don’t know. Am I going to see you at NCTE? I have had a busy summer! It seems to be winding down now that I have completed AP English Literature training. 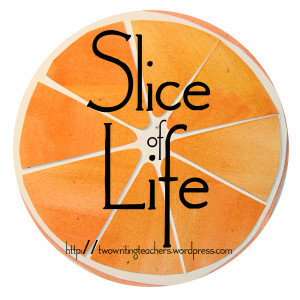 Maybe now that I’ve finished most of my summer PD, I will have a bit more time to blog. Years ago and early in my career, one of my schools was considering sending me to AP Language training, but I moved on to a different school before that happened. I don’t think my previous principal would ever have considered it for a variety of reasons. One of the reasons I finally did it was that our chief AP Literature teacher was overloaded, and I thought it would help him out. I had a great week at Fitchburg State University in nearby Fitchburg at the training. The other teachers in my group were a great group of educators. Most of them were public school teachers, so I learned a lot about public schools in Massachusetts. Interesting stuff. Frankly, none of what I heard made me want to go back to public schools, though my own children have received a good education from our local public school system. The system just seems designed to frustrate teachers nowadays. It makes me sad. I am a little on the fence about whether or not to continue pursuing my Massachusetts teaching certificate. In some ways, it seems like such a hassle. I am tempted to go for National Board Certification, even though I know the amount of work involved, principally because I wouldn’t have to worry about the different certification rules for different places. (Is that accurate, those of you who are NBCT?) I have wanted to do it anyway. As to the AP training, my instructor is a brilliant AP teacher. 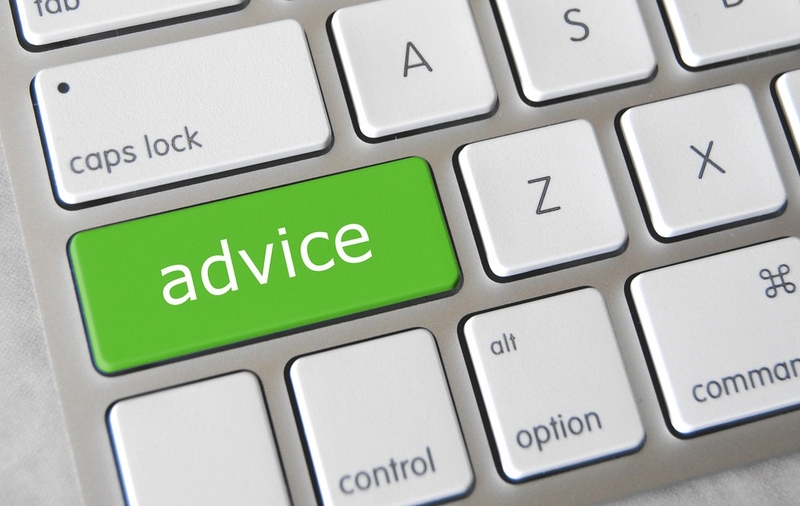 We got a lot of great tools and no-nonsense advice. I liked her a lot. She really helped me clear up why TPCASTT was not working as well for me as I wanted it to (I was, naturally, doing it a little bit wrong—not totally wrong, but wrong enough that the kids were not doing more than scratching the surface). I was dreading the poetry part, I am not going to lie. I know that teaching AP involves teaching a lot of poetry, and frankly, I was feeling like I wasn’t very good at that, but the tools that my instructor gave me have made me feel a lot more confident. I am really excited about the course and getting going now. I was, I admit, feeling a bit intimidated and not at all sure about AP in general. I still think it should be a bit more open than it is at my school, but I learned a great deal about how it functions at other schools. I also learned a lot about the AP rubric and how to grade. I was fairly consistently two points below what the instructor said the College Board graded several of the essays. I guess if you are going to have a grading issue, then grading a little lower is better than being too high because the students will possibly do better on the exam. By the end, though, I was figuring it out pretty well, and the last round of papers we evaluated, I hit the mark each time. The last few days, I’ve been working on reading the books I want to teach and the course audit syllabus. I am feeling pretty confident about the way the course is shaping up. In other news, I received my new work computer today, and I backed up my old work computer to an external hard drive and restored EVERYTHING without any help. Woo! I was pretty happy with myself. I am going to work a little bit more on my AP materials before I put the computer to bed tonight. The new install went great. It took a little while (but probably less than two hours). I was nervous when the status bar said the time remaining was over 100 hours at one point, but it turns out that the status bar was lying. What are you up to this fine Tuesday? The post on chapters 1 and 2 has been up over a week with very little activity in the comments. I think folks are busy going back to school and perhaps don’t have the time they thought they might have to engage in an online book club. I have so much I must read to prepare for the coming school year, and it seems as though the best idea is to suspend the book club. Perhaps we can start a book club up after the school year begins in earnest and things have settled down for everything.